Humans are excellent at transporting plants and animals to new places that would naturally be out of their reach. This can be a problem, because new species can dramatically impact the environment in which they are introduced. One of the most devastating human introduction is that the of the cane toad (Rhinella marina) from South America and mainland Central America into Australia. We brought canes toads to Australia in 1935 as a predator to eat beetles that were harmful to sugar cane crops. Since then, the toads have dramatically increased in number due to their lengthy breeding seasons, and their toxic skin, which helps protect them from predators . Cane toads secrete toxins throughout their skin and especially in the large glands close to their heads. When ingested this toxin can be lethal due to its negative impacts on the cardiovascular and respiratory systems . Predators that are not aware of the cane toad’s lethal defenses will attack and consume these toads leading to drastic declines in their populations. Over time, some predators have learned to avoid cane toads or to avoid eating their heads and large glands. Gaining experience with this new prey can help predators avoid extinction. To learn how predatory behavior may differ with cane toad experience, researchers compared predators that are toad free with predators that live in areas with cane toads for more than 70 years. The study focused on the nocturnal cat like marsupial known as northern quoll (Dasyurus hallucatus), which has been classified as endangered because of the impact of cane toads. They tested for differences in predatory behavior when toad-free and toad-infested populations were exposed to a dead cane toad or to a dead mouse. Specifically, they looked at the proportion of time spent sniffing, pawing and biting these two prey items. The northern quoll (Dasyurus hallucatus). By Wildlife Explorer – Picasa Web Albums, CC BY 3.0, https://commons.wikimedia.org/w/index.php?curid=9488385. Researchers found that quolls from areas with cane toads for many years (toad-infested) rarely bit or pawed at the offered toad, but instead mostly inspected the toad by sniffing. In contrast, quolls from toad-free populations frequently bit and pawed the toad, just as much as the mouse. This suggests quolls with experience with cane toads investigate the lethal prey item, but rarely attempt to ingest it. On the other hand, quolls with no experience attempted to bite the cane toads, meaning they may be vulnerable to decline if cane toads expand their range into those areas. 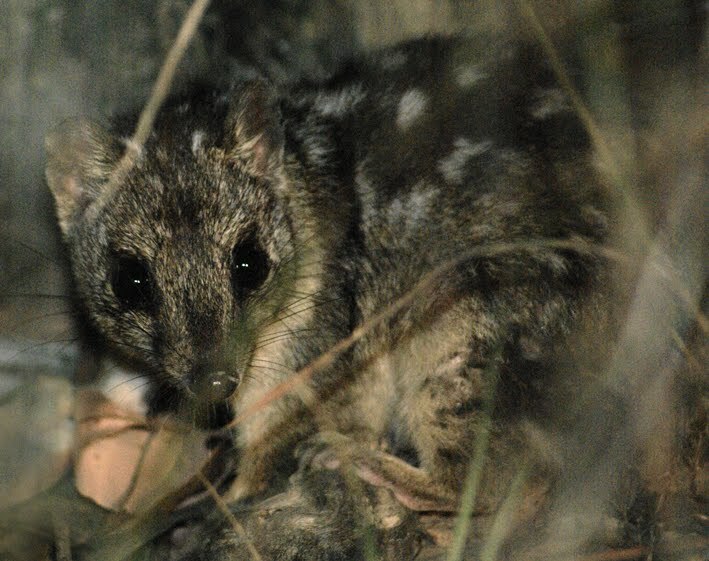 What does this mean for the toad-free quolls populations? The researchers also set out to quantify the impact of cane toads reaching toad free quoll populations. They calculated how likely a quoll population was to go extinct based on the probability of a quoll to be killed by a cane toad. They found that if the quolls will attack toads one third of the time they encounter them, they are likely to go extinct. This result further reinforces the notion that toad free quoll populations will be threatened if cane toads are introduced into their habitats. Overall this study highlighted the impact that invasive species can have on other animals, especially when they carry lethal defenses. They also showed the importance of behavior in adjusting to habitat change. By learning that frogs are dangerous, toad-infested quolll populations have persisted and avoided extinction. Future work should focus on how we can help toad-free northern quolls learn to avoid cane toads before they experience large population losses. I am in the process of completing my PhD in Ecology and Evolutionary Biology at the University of Massachusetts in Boston. I am interested in human environmental changes as natural experiments to test hypothesis about the evolution of animals. Specifically, I study small lizards known as anoles and how living near human households impacts their ecology and behavior. I love fieldwork because often it takes me away from the cold and towards the sunny beachy islands that I love the most. Are Eastern USA Temperate Forests Regenerating? Small Urban Streams and Nutrient Removal: What’s Going On?